The Bermuda Triangle is a place where Hundreds of ships have been disappeared, leading to strange rumours of paranormal activity and alien invasions. 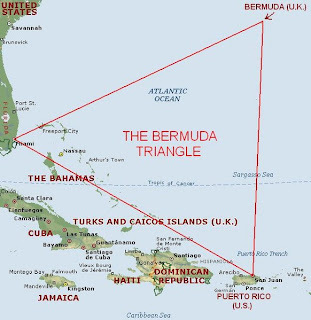 The Bermuda Triangle is a region in the western part of the North Atlantic Ocean in which a huge number of aircraft and surface vessels were disappeared in a Mysterious manner that cannot be explained by human error, piracy, equipment failure, or natural disasters. But the ships disappearances could simply been caused by methane bubbles escaping from the sea bed, according to a new report by Scientists. The principle phenomenon is - if you mix enough bubbles into water, it lowers the density of the water so that anything floating on its surface will sink. A group of American scientists came up with a simple way of putting this theory to the test. They made bubbles in a beaker of water by feeding air into the bottom of it. Then they dropped in balls of different weights, to see which would float. Balls that floated in still water, sank when the bubbles were switched on. The same mechanism could explain why ships sink in the Bermuda Triangle. 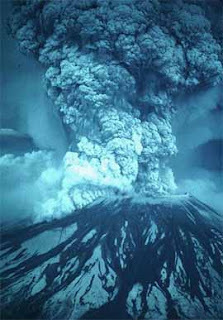 Michael Denardo, who led the team, said "If a phenomenon can be made to occur in a lab, it probably happens somewhere in the natural universe." The Bermuda Triangle is a region in the western part of the North Atlantic Ocean in which a huge number of aircraft and surface vessels were disappeared in a Mysterious manner that cannot be explained by human error, piracy, equipment failure, or natural disasters. 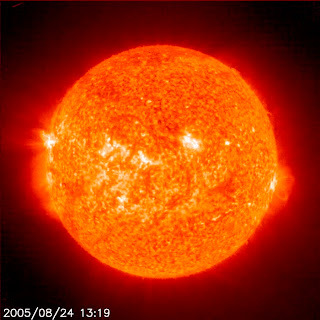 The above image was taken by NASA. 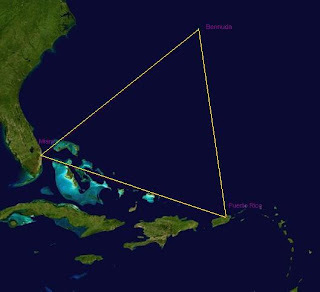 The mysterious Devil's triangle covers boundary between the Straits of Florida, the Bahamas and the entire Caribbean island area and the Atlantic east to the Azores.The most of the accidents occurred along the southern boundary around the Bahamas and the Florida Straits. The area is one of the most heavily-sailed shipping lanes in the world, with ships crossing through it daily for ports in the Americas, Europe, and the Caribbean Islands. Cruise ships are also plentiful, and pleasure craft regularly go back and forth between Florida and the islands. It is also a heavily flown route for commercial and private aircraft heading towards Florida, the Caribbean, and South America from points north. US Navy TBF Grumman Avenger flight, similar to Flight 19. Flight 19 was a training flight of TBM Avenger bombers that went missing on December 5, 1945 while over the Atlantic. 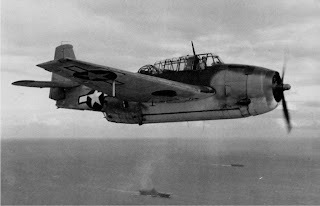 The picture shown above is the picture of US Navy TBF Grumman Avenger flight. * Adding to the mystery, a search and rescue Mariner aircraft with a 13-man crew was dispatched to aid the missing squadron, but the Mariner itself was never heard from again. Later, there was a report from a tanker cruising off the coast of Florida of a visible explosion at about the time the Mariner would have been on patrol. * While the basic facts of this version of the story are essentially accurate, some important details are missing. The weather was becoming stormy by the end of the incident, and naval reports and written recordings of the conversations between Taylor and the other pilots of Flight 19 do not indicate magnetic problems. * The mysterious abandonment in 1872 of the 282-ton brigantine Mary Celeste is often but inaccurately connected to the Triangle, the ship having been abandoned off the coast of Portugal. The event is possibly confused with the loss of a ship with a similar name, the Mari Celeste, a 207-ton paddle steamer that hit a reef and quickly sank off the coast of Bermuda on September 13, 1864. Kusche noted that many of the "facts" about this incident were actually about the Marie Celeste, the fictional ship from Arthur Conan Doyle's short story "J. Habakuk Jephson's Statement" (based on the real Mary Celeste incident, but fictionalised). * The Ellen Austin supposedly came across a derelict ship, placed on board a prize crew, and attempted to sail with it to New York in 1881. According to the stories, the derelict disappeared; others elaborating further that the derelict reappeared minus the prize crew, then disappeared again with a second prize crew on board. A check from Lloyd's of London records proved the existence of the Meta, built in 1854 and that in 1880 the Meta was renamed Ellen Austin. There are no casualty listings for this vessel, or any vessel at that time, that would suggest a large number of missing men were placed on board a derelict that later disappeared. * The incident resulting in the single largest loss of life in the history of the US Navy not related to combat occurred when USS Cyclops, under the command of Lt Cdr G. W. Worley, went missing without a trace with a crew of 309 sometime after March 4, 1918, after departing the island of Barbados. Although there is no strong evidence for any single theory, many independent theories exist, some blaming storms, some capsizing, and some suggesting that wartime enemy activity was to blame for the loss. * Theodosia Burr Alston was the daughter of former United States Vice President Aaron Burr. Her disappearance has been cited at least once in relation to the Triangle. She was a passenger on board the Patriot, which sailed from Charleston, South Carolina to New York City on December 30, 1812, and was never heard from again. The planned route is well outside all but the most extended versions of the Bermuda Triangle. Both piracy and the War of 1812 have been posited as explanations, as well as a theory placing her in Texas, well outside the Triangle. * S.V. Spray was a derelict fishing boat refitted as an ocean cruiser by Joshua Slocum and used by him to complete the first ever single-handed circumnavigation of the world, between 1895 and 1898. * In 1909, Slocum set sail from Vineyard Haven bound for Venezuela. Neither he nor Spray were ever seen again. * A five-masted schooner built in 1919, the Carroll A. Deering was found hard aground and abandoned at Diamond Shoals, near Cape Hatteras, North Carolina on January 31, 1921. Rumors and more at the time indicated the Deering was a victim of piracy, possibly connected with the illegal rum-running trade during Prohibition, and possibly involving another ship, S.S. Hewitt, which disappeared at roughly the same time. Just hours later, an unknown steamer sailed near the lightship along the track of the Deering, and ignored all signals from the lightship. It is speculated that the Hewitt may have been this mystery ship, and possibly involved in the Deering crew's disappearance. * On December 28, 1948, a Douglas DC-3 aircraft, number NC16002, disappeared while on a flight from San Juan, Puerto Rico, to Miami. No trace of the aircraft or the 32 people onboard was ever found. From the documentation compiled by the Civil Aeronautics Board investigation, a possible key to the plane's disappearance was found, but barely touched upon by the Triangle writers: the plane's batteries were inspected and found to be low on charge, but ordered back into the plane without a recharge by the pilot while in San Juan. Whether or not this led to complete electrical failure will never be known. However, since piston-engined aircraft rely upon magnetos to provide spark to their cylinders rather than a battery powered ignition coil system, this theory is not strongly convincing. * G-AHNP Star Tiger disappeared on January 30, 1948 on a flight from the Azores to Bermuda; G-AGRE Star Ariel disappeared on January 17, 1949, on a flight from Bermuda to Kingston, Jamaica. Both were Avro Tudor IV passenger aircraft operated by British South American Airways. Both planes were operating at the very limits of their range and the slightest error or fault in the equipment could keep them from reaching the small island. One plane was not heard from long before it would have entered the Triangle. * On August 28, 1963 a pair of U.S. Air Force KC-135 Stratotanker aircraft collided and crashed into the Atlantic. The Triangle version (Winer, Berlitz, Gaddis) of this story specifies that they did collide and crash, but there were two distinct crash sites, separated by over 160 miles (260 km) of water. However, Kusche's research showed that the unclassified version of the Air Force investigation report stated that the debris field defining the second "crash site" was examined by a search and rescue ship, and found to be a mass of seaweed and driftwood tangled in an old buoy. * SS Marine Sulphur Queen, a T2 tanker converted from oil to sulfur carrier, was last heard from on February 4, 1963 with a crew of 39 near the Florida Keys. Marine Sulphur Queen was the first vessel mentioned in Vincent Gaddis' 1964 Argosy Magazine article, but he left it as having "sailed into the unknown", despite the Coast Guard report, which not only documented the ship's badly-maintained history, but declared that it was an unseaworthy vessel that should never have gone to sea. * One of the more famous incidents in the Triangle took place in 1921 (some say a few years later), when the Japanese vessel Raifuku Maru (sometimes misidentified as Raikuke Maru) went down with all hands after sending a distress signal that allegedly said "Danger like dagger now. Come quick! ", or "It's like a dagger, come quick!" This has led writers to speculate on what the "dagger" was, with a waterspout being the likely candidate (Winer). In reality the ship was nowhere near the Triangle, nor was the word "dagger" a part of the ship's distress call ("Now very danger. Come quick."). Having left Boston for Hamburg, Germany, on April 21, 1925, she was caught in a severe storm and sank in the North Atlantic with all hands while another ship, RMS Homeric, attempted an unsuccessful rescue. * A pleasure yacht was found adrift in the Atlantic south of Bermuda on September 26, 1955; it is usually stated in the stories (Berlitz, Winer) that the crew vanished while the yacht survived being at sea during three hurricanes. The 1955 Atlantic hurricane season lists only one storm coming near Bermuda towards the end of August, hurricane "Edith"; of the others, "Flora" was too far to the east, and "Katie" arrived after the yacht was recovered. It was confirmed that the Connemara IV was empty and in port when "Edith" may have caused the yacht to slip her moorings and drift out to sea. * A Cessna piloted by Carolyn Cascio, on June 6, 1969, with one passenger, attempted to travel from Nassau, Bahamas to Cockburn, Grand Turk Island. The plane was witnessed by many air traffic controllers in Cockburn's airport to circle the island for 30 minutes, after which, it flew away apparently for another island. All attempts from the ground to raise Cascio on the radio failed. So it's about density, huh? Interesting.. didn't know that density can make such terrible accidents on water. How abuot aeroplanes which flew above it? Is it also sinked because of density? Wow..
Niburu does not exist and nothing special will happen in 2012. Save your money. Oh really?? What about the aircrafts that had dissapeared?? How can you explain this? Appreaciate for the work you have put into this post, this helps clear away a few questions I had. It regularly amazes me precisely how web-site owners for example your self can discover sufficient time as well as the commitment to carry on making excellent weblog posts. Your internet site isgreat and one of my need to read websites. I just had to thank you. Hi! An individual in my Facebook group shared this web page with us so I came to take a look. I'm certainly loving the facts. I'm book-marking and is going to be tweeting this to my followers! Great weblog and wonderful design and style.